It seems like summer was just yesterday, but the shorter days and longer nights remind us of winter’s progress. Coming up this December is the Winter Solstice which marks the point in the year where the night is the longest, truly our darkest day. Observing the Solstice has been an aspect of many cultures from ancient times onward, and celebrated as a moment of rebirth in our year, as the days gradually begin to get longer. While we observe the Winter Solstice as an entire day, technically the Solstice refers to a very specific moment in Earth’s orbit. This year in Phoenix, the moment of the Winter Solstice will be on December 21, at 3:23 PM, a little bit before sunset. The point at which the North Pole is furthest from the sun and the Tropic of Capricorn is the closest is where we can pinpoint the Winter Solstice. The Summer Solstice reverses these conditions, it occurs when the South Pole is furthest from the sun and the Tropic of Cancer is closest. What the position of the Earth makes clear is the reversal of seasons in the Southern Hemisphere. 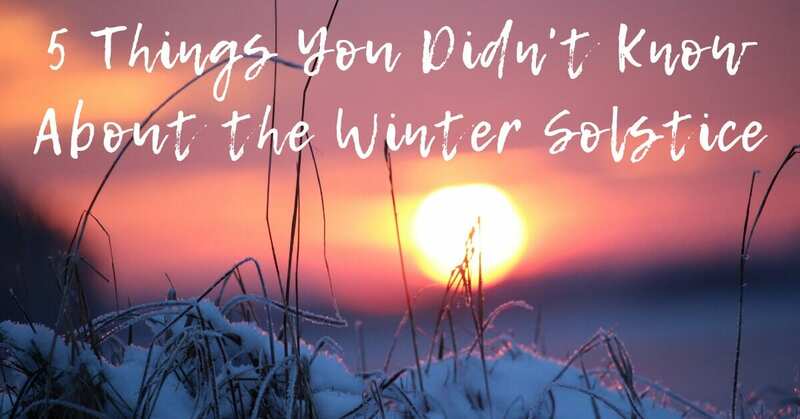 The time of year we experience as winter in the Northern Hemisphere, commonly considered to be December, January and February, constitutes the summer months in the Southern Hemisphere. Similarly, our shortest day of the year is their longest day. While many cultures have traditional ways of celebrating the Winter Solstice, some say that the day is controlled by spirits with bad intentions, much like how we think about Halloween. Celtic traditions include lore that the solstice was a time for troublesome spirits to walk the Earth, as does ancient Germanic lore. Zoroastrian reflections on Solstice warn of it being a long night full of evil spirits. Fortunately, their solution is to stay warm inside with close friends, eating and entertaining each other until the danger has passed! For the most part, humans have seen the Winter Solstice as a cause to celebrate. After all, it was as low as the sun was going to go and the promise of spring starts becoming clear with the growing daylight and warmth. Winter Solstice is most often celebrated as a moment of rebirth or triumph over darkness. The Solstice traditions of Northern Europe include burning a Yule Log to welcome back the light to the world. The Iranian festival of Yalda is on Solstice, which has its roots in celebrating the birth of the pre-Islamic sun god Mithra, who conquers the dark. Druidic tradition holds to a similar tale wherein the festival of Alban Arthan marks the death of the year’s old sun and the birth of a new sun. The Solstice is the swing point between darker and lighter days, and so it is also celebrated as a time of reversal. Ancient Rome marked the day as Saturnalia, and celebrated it with a festival that overturned most social orders. Households would appoint an “Emperor of Misrule” and masters would serve their servants. Drinking, mischief and taking on new identities with costumes and masks were all part of the celebration of Saturnalia. Humans have long taken cosmic note of Solstice as an important day in the year, but it is a day that has shaped our history as a species as well. Solstice has marked the broadening of horizons. It is the date when Marie Curie first discovered radium, opening up science to atomic innovation. The frontiers of outer space were also shaped on Winter Solstice by the Apollo 8 launch which was the first manned craft to reach Earth’s moon. Because Earth’s orbit around the sun (marking years) isn’t tethered to how the Earth spins on its own axis (marking days), the date of Winter Solstice can shift a little from year to year. This is similar to the reason we add an extra day to a leap year every 4 years. In general, Solstice will usually be either the 21st or 22nd of December. Once in a blue moon however, the date of the Solstice can shift as early as the 20th or as late as the 23rd. For all that is special about our beautiful Sun, CC Sunscreens knows that sometimes you need to outsmart it. For long lasting, passive energy conservation, turn to CC Sunscreens. With our innovative materials and custom design and installation we can block excess heat and keep you comfortable all year round. Get ahead of the curve this year with a consultation with CC Sunscreens today!